Kangaroos, giraffes, and elephants, oh my! 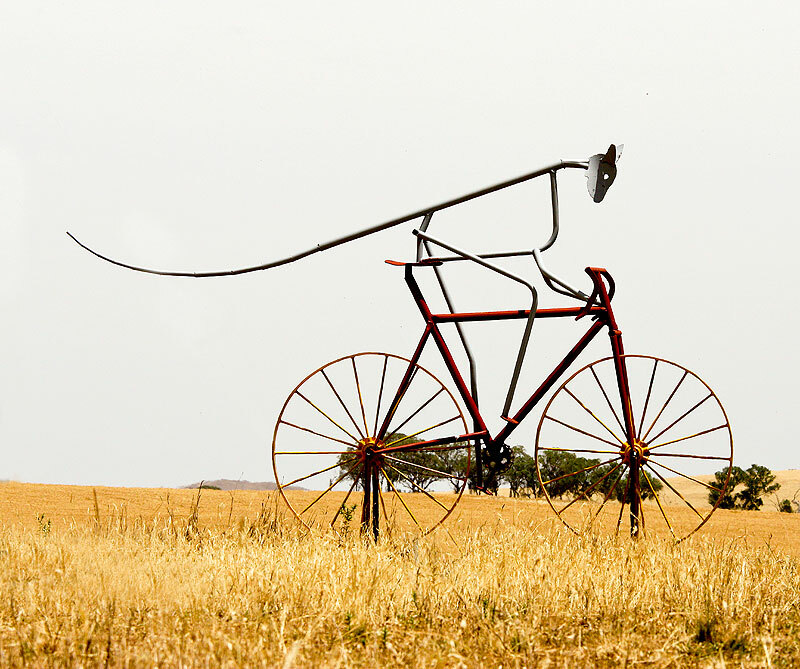 A little bit of community creativity in Central Western NSW has resulted in some highly original roadside attractions, writes Eleanor Griffin. While driving along Obley Road in Central Western NSW, near Dubbo, you might be startled by the sight of colourful animals trailing along beside your car – and on bikes no less. Take another look though. The 45 kooky constructions dotted throughout the region could be worth the trip in themselves, as they’re most definitely original and entirely offbeat. The locally created “Paddock Art” has been dreamed up and constructed by the farming families of the area, from kids to adults, with everyone chipping in to make 120km of quirky roadside scenes on the way to Dubbo Zoo and other local attractions. 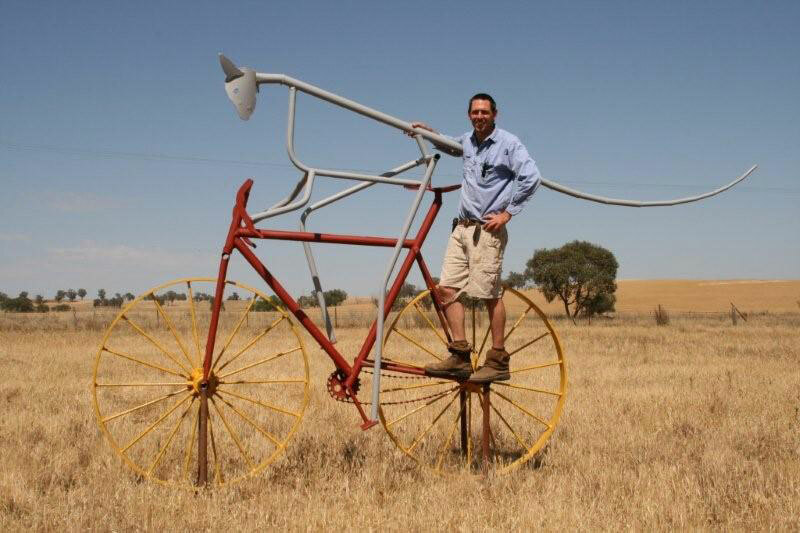 As part of a regional race to create the best sculptures, several prize categories were created, with the first prize of $1000 for Best Sculpture by a Farmer/Farmer’s Wife going to Robert Armstrong for “Yullundry Roo” the aerodynamic kangaroo bent to the wind over the giant spindles of its bicycle. 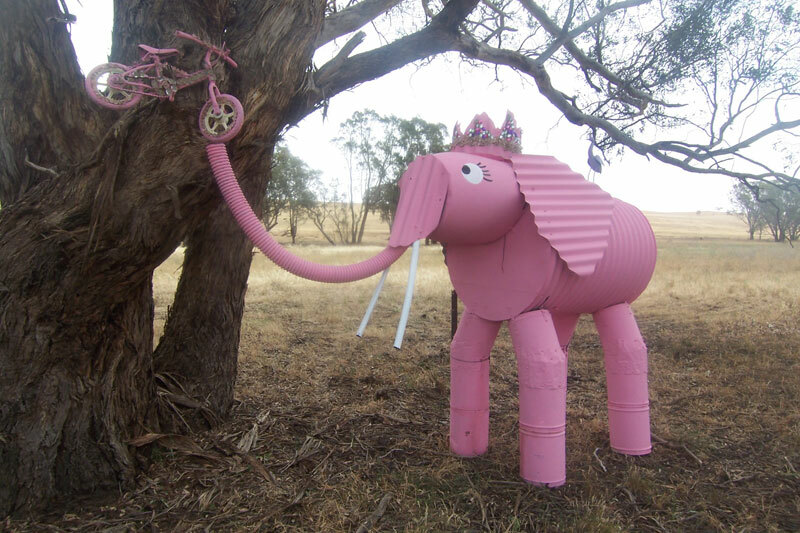 Another standout is the pink elephant plucking a bicycle from the branches of a tree, which was lovingly created by Christine Weston and her family, who (along with Debbie Blatch) gave birth to the entire idea. The Cumnock & District Progress Association arranged welding classes for participants, and the ten winners received around $6000 worth of prizes for their efforts. But the best part is that most of the sculptures will remain on the tourist trail year round. It might have been a little more difficult to persuade the real life creatures to pose on bikes, but these creations are no less entertaining and an extra surprise for those playing eye-spy.